Preservations Save Our Springfield (SOS) shares their side of the story that led to the unfortunate demise of 439 East 1st Street. On the surface, it appears that MCCD and the City did everything right. That they followed proper protocol and followed the law as they should. Dig a bit deeper and the facts tell a different story. At the October 28, 2015 Historic Preservation Commission (HPC) meeting Municipal Code Compliance Division (MCCD) pulled off a last minute addition to the agenda. They forced an unannounced (meaning it was not on the agenda so therefore was added after the deadlines) Opinion of Appropriateness (OOA) to get support for the emergency demolition of 439 East First St. This was not some last minute, thrown together presentation either. Present from MCCD was Thomas Register (code enforcement inspector) and Michael Chao (code enforcement engineer)as well as Brian Moser, (head of code enforcement) , and perhaps more telling, Kimberly Scott, Mr. Moser's boss. To support her people, Ms Kimberly Scott also brought in Tom Goldsbury (head of Building Inspection Department). The discussion covers 39 pages (975 lines of text) in the minutes. While they were obviously hoping to push something quickly past Staff (Historic Planning Department) and the HPC, the preservationists were there, watching. After much discussion, Historic Preservation Committee (HPC) said Furthermore, the commissioners felt and stated for the record that the house should be saved even if the rear addition was demolished. They voted on this as a strategy for the house, and unanimously approved their recommendation regarding the preservation of 439 East First Street. At this point too, it may be worthwhile to ask ourselves a question. When the ordinances involved allow for the emergency demolition of even historic structures, why did the MCCD and Ms. Scott bother to work so hard to get approval of what they were indeed calling an emergency demolition? In the past, they have been successful in taking historic houses in Springfield as emergencies and filing the paperwork after the fact. What was different this time? The only answer I can come up with is that you can not utilize federal funds for emergency demolitions. By getting permission first, they can use federal dollars like unused NSP3 funds. 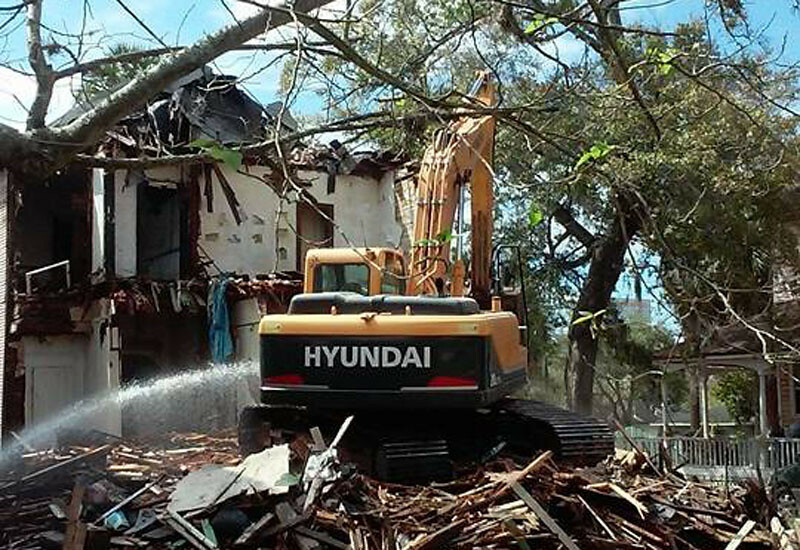 For the December 9, 2015 HPC meeting an official COA (15-913) was presented by code enforcement to demolish this house. This time, staff approved the COA application. Double face palm. I do appreciate the issues staff has –- they need to follow the desires of the City, at times, to help insure their jobs. Still, this was a clear reversal of the discussion the commissioners had at the October meeting. No new evidence had been presented to warrant even considering a change from the OOA in October. The discussion and public meeting over COA 15-913 took close to an hour and a half and covers 108 pages (2700 lines of text) . Brian Moser and Michael Chao were back and they brought Tom Goldsbury with them as well. Missing was Kimberly Scott this time. Although newly appointed department head Bill Killingsworth was there. Lots of city juice for one neglected home in Springfield. Just about every person who spoke was against the demolition. Those same people also recognized that the rear addition was the issue and did indeed need to come down. In the end, the HPC voted to approve the COA but with the single condition that ONLY the rear addition or actually the rear enclosed porch, be demolished. Driving down the road, a PSOS member notices a fire hose stretching across the street. The hose leads to the back of the house where an assorted group of white trucks and people in khakis are watching the demolition of the structure from behind their steering wheels. A single man is holding a fire hose aimed loosely at the excavator. The MCCD on site supervisor said that the house was deemed unsafe and needing to come down after an engineer walked inside. Preservation SOS members were then informed that the final order said that once the rear porch was removed, and if the Division (MCCD) decided it was a public threat, the entire house could be taken down. This puzzled those present who were actually in attendance at the December meeting. Of course, the fact is that an excavator was brought to tear down the rear porch, which is about the equivalent of taking an atom bomb to a knife fight. While an engineer was present for a time, no one could remember his name. It began to look suspiciously like the intention from the start of the day was to take down the entire house. When PSOS reviewed the actual Final Order, we saw that the personnel from MCCD were actually right in what they said. There were in fact two conditions to the approval of the demolition in the Final Order and MCCD did indeed follow the letter of the Final Order as it was written. A review of the minutes from that hearing proved that the actual motion voted on was for the single condition of demolishing the rear enclosed porch only. No mention of anything else in the motion that was seconded and approved. There as a short discussion of what if the main house is found to be much worse after the enclosed rear porch is removed but it was suggested that the MCCD would have to come back to get a Minor Modified COA (MMA) because not enough was known about the main structure to even consider giving approval to tear it down.